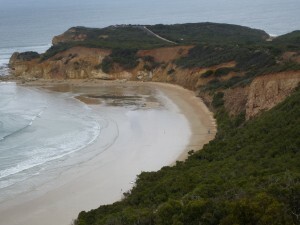 Great Ocean Road ~ One of Victoria’s Best Known Destinations. Artillery Rocks, about 14 minutes drive west of Lorne. Find the best Price for other Apollo Bay Accommodation options here. 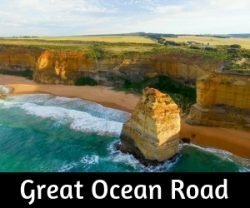 The Great Ocean Road is one of the best coastal drives around and deserves more than a one day tour.. unless there is no time otherwise of course. It is over 500 km’s return trip, and with so much to see and do, 3 days is a recommended time to explore most areas. 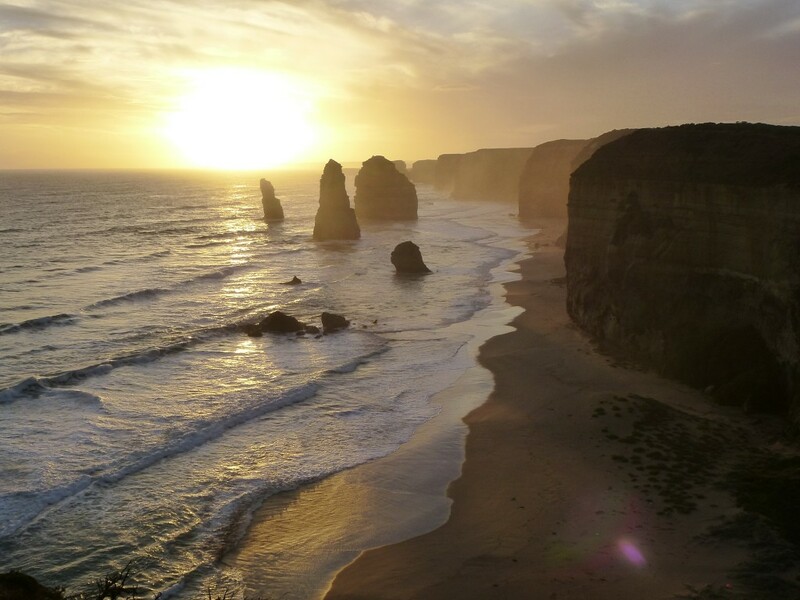 Find more day trip plans and accommodation options over at ‘Explore The Great Ocean Road’. A Brief History: The Great Ocean Road is a permanent memorial to those who died while fighting in World War I. It winds around the rugged southern coast of Victoria, carved into the rock face in many places. Built by returned servicemen, a huge engineering task that ended many years of isolation for Lorne and surrounding communities. Plans for an ocean road first began in the 1880s, but only started to become reality towards the end of the First World War. The chairman of the Country Roads Board contacted the State War Council with a proposal that funds be provided for re-employment of returned soldiers on roads in sparsely populated areas. 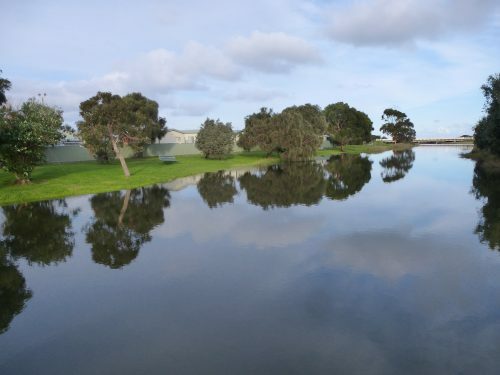 Chairman W Calder submitted a plan he described as the ‘South Coast Road’ which suggested a road starting at Barwon Heads, following the coast around Cape Otway and ending near Warrnambool. Building of the Great Ocean Road. 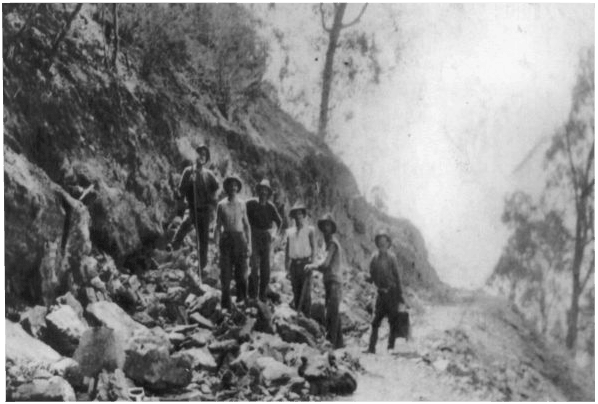 It was the Geelong mayor, Alderman Howard Hitchcock, who finally began the project. He formed the Great Ocean Road Trust, and raised the money to finance the project. 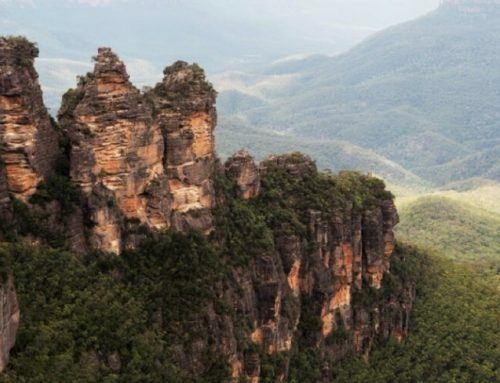 He had the grand view of its worth as a tourist attraction, proclaiming it better for its ocean, mountain, river and fern gully scenery than the Riviera in France, the San Francisco Road and Bulli Pass in New South Wales. We recommend staying 2 nights in Apollo Bay and doing a circuit on the second day then returning to Melbourne along the Ocean Road again on the 3rd day. It is possible to return inland of course, but seeing the road from the reverse direction is a bonus! This suggested itinerary can of course be modified, if you have less time or more… or if you are heading on to Adelaide etc. Pick up some maps before you head off if you can! This is a suggested guide, but stop when the whim strikes… deviate… enjoy the journey. 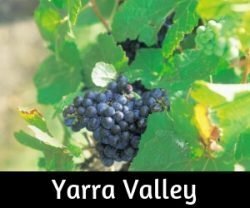 During the summertime, when we have daylight savings, this itinerary is fairly easy to complete – but when the days are shorter please make allowances. Get out of Melbourne as early as you can (particularly if daylight savings has ended). 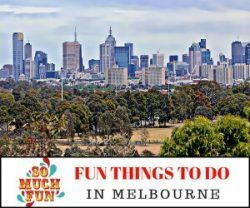 Cruise over the West Gate Bridge and along to Geelong, staying on the freeway/motorway until you see the signs for The Great Ocean Road. It will take under 1 1/2 hours from Melbourne to the Ocean Road Coast approximately. How easy is that! Heading down to the coast from the freeway, divert to Bells Beach to see where the big surfing classic is held or continue towards Anglesea. A really nice walk to do is at Point Addis. Either drive all the way to the car park at the end of the road and walk down to the beach and along the trails if time permits. 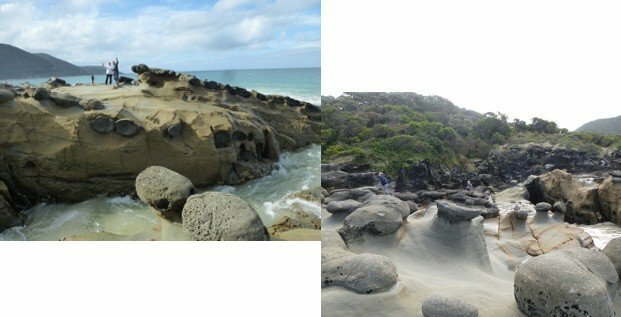 Next return to the Great Ocean Road and cruise along the road through the townships of Anglesea and Airey’s Inlet… (if you would love to have a horse ride on the beach? Check out Blazing Saddles). Stop at the Memorial Arch, have a play on the beach… and then continue to Lorne. This is a popular seaside town with some lovely walks, waterfall…loads of cafes and shops, plus an excellent beach. From Lorne keep heading west towards next biggish town of Apollo Bay. The drive takes about 1 hour, not allowing for stops. This is the winding, coast-hugging part of the drive! Artillery Rocks is one of our favourite stopping points. Not well signposted, but it is about 12 kms from Lorne. Popular fishing spot with awesome rocks. Caution: Beware of large waves and dangerous conditions! Koalas! An Aussie icon and plenty to be found along the Ocean Road, if you know where to look. The tiny township of Kennet River, about 25 minutes drive from Lorne, is a great spot (along with Cape Otway, further on). Turn right into Kennett River and left onto Grey River Road… just follow up along this road a little way and look out for koalas in the trees. Crimson Rosellas and King Parrots are often found seeking a handout of bird seed by the Kennett River store. The little camping park at Kennett River is a great location, for anyone enjoying a longer trip. Further up Grey River Road, about 5km, is the Grey River Reserve. It is a basic picnic ground, but with toilet facilities and is pretty. At night there is a wonderful display of ‘Glow Worms’.Glow worms are not really worms, but are actually the larvae of an insect known as the fungus gnat. Take a torch if you happen to go here, but do not point it directly at the little critters! 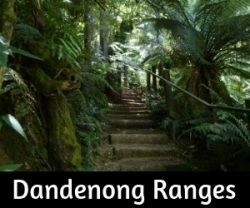 Kennett River – Koalas, Rosellas, King Parrots and Glow Worms! If anyone is really keen to return to see the Glow Worms from Apollo Bay (if staying there) it is approx. 35-40 mins drive from Apollo Bay to the Grey River Reserve or 20 minutes drive to Maits Rest where they can also be seen. Glow worms can also be seen at the Melba Gully rainforest walk just outside Lavers Hill, 45 mins west of Apollo Bay. 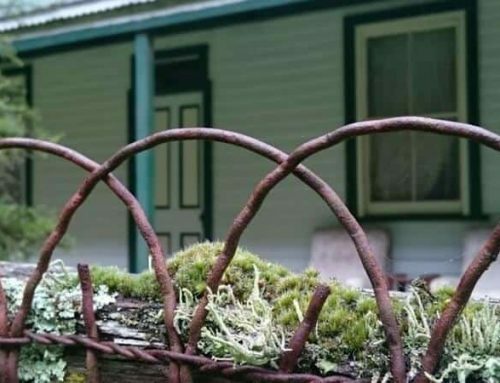 You would be best to find accommodation at Lavers to see them here, either in a motel or B & B. Continue on to Apollo Bay, our recommended two night stop over if following this itinerary. A lovely little seaside town with a gloriously long, safe beach. Getting to the 12 (12?) Apostles and back to Apollo Bay. Drive back through Apollo Bay towards Lorne, just a couple of km’s on the left is Wild Dog Road. A narrow winding dirt road that leads up into the Otways Forest. 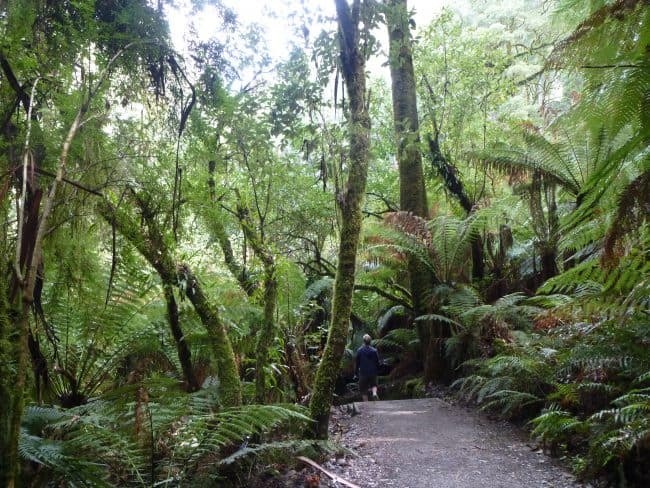 Follow signs to The Otway Fly and then continue down to Triplet Falls. The walk takes about 40 minutes. The drive from Apollo Bay to Triplet Falls via Wild Dog Road will take approximately 1hr, 15 mins. BUT – It is a narrow, winding, unsealed road. We love the drive, but it is not for the faint-hearted necessarily! Take the sealed Ocean Road route via Lavers Hill if at all concerned! 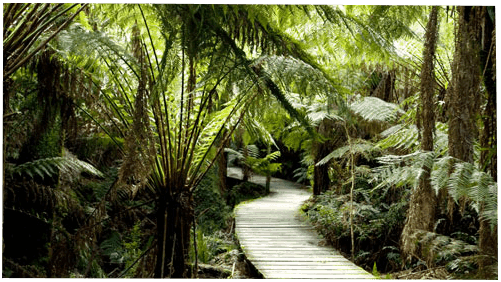 The Otway Fly is a Treetop Walk and The Otway Fly Zip Line Tour, great to do as well, enough you have the time… it will be a lot to fit into one day though when going to the 12 Apostles and back to Apollo Bay. 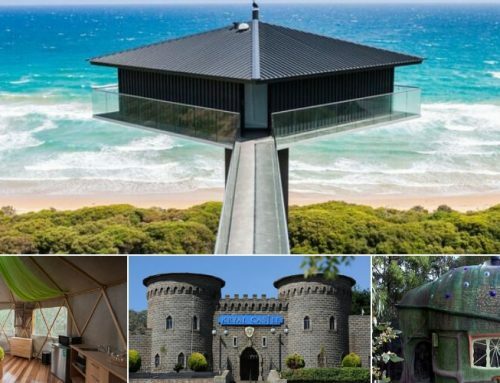 If you want to do the Otway Fly in a 3 day trip down this way… maybe stay the second night in Port Campbell, return inland or via the Ocean Road again. After the waterfalls walk head back onto the main road and go left to Lavers Hill and on down to the Port Campbell National Park (about 1.5 hours from the falls). Allow for plenty of time to walk down to Gibson’s Beach, take in the view at the Apostles and it is easy enough to spend a couple of hours walking around the Loch Ard Gorge area. Helicopter flights operate from the 12 Apostles parking area… not a bad way to get another view! All these scenic points are close together. Port Campbell is about 12 minutes drive from Loch Ard Gorge. Remember to collect a map prior to reaching this point! Makes it much easier to get your bearings! The return drive from Port Campbell to Apollo Bay takes about 1.5 hours. Head back up to Lavers Hill then continue to follow the Great Ocean Road down. Cape Otway is worth a visit, but you really need to have an extra day up your sleeve for that. Gibsons Beach, Port Campbell National Park. Maits Rest Rainforest walk is a must do on the way back. It is a few minutes drive past the Cape Otway turn off (still on the Ocean Road). A short 800m walk of maybe 20 minutes, but take your time. It is an awesome little track through the forest! Relax… return to Melbourne via the Great Ocean Road. Driving from Apollo Bay, without many stops, takes about 3 1/2 hours / 196km’s. Would you prefer to find a bus tour? Check out these options.